PHP Dangal saw an overwhelming response of participants to compete in a skill-based event. It was an intense 4 weeks long battle that had both experienced and students giving all that they got, to earn a place at the top 5. With much-needed dexterity and placidness our winners topped the list of best PHP developers. 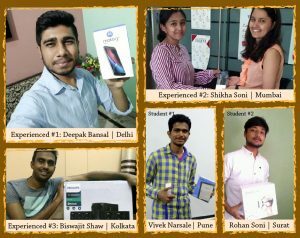 The contest had earned our winners an opportunity to win prizes such as Moto G Plus – 4th Gen, Fitbit Charge HR, Philips multimedia speaker system, New Kindle E-reader and a Procus PRO VR Headset. Having said this, we also take great privilege in thanking Techgig and Xento staff members for supporting us in making PHP Dangal a successful event.